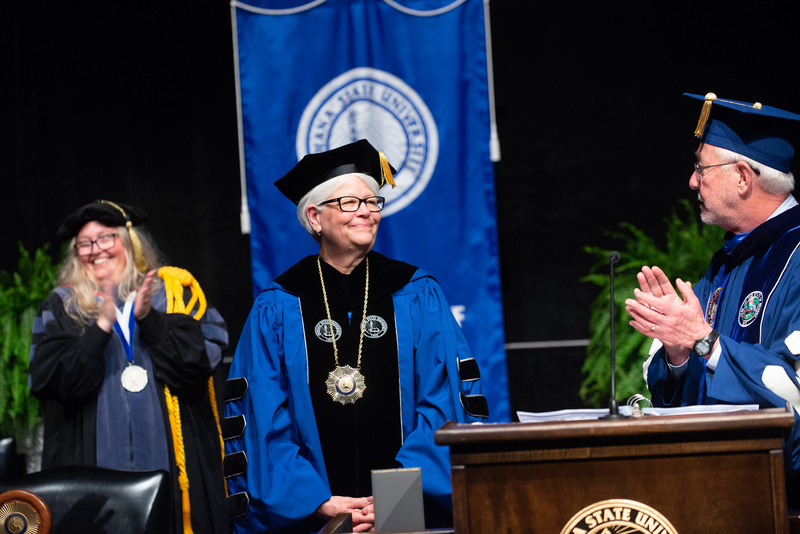 Flanked by family and friends, Deborah J. Curtis was presented with the presidential medallion Friday, officially signifying her installation as the 12th president of Indiana State University. And even though she was undoubtedly the focus of the event, Curtis turned the attention away from her toward the university's impact -- and the partnerships that facilitate it. "I recognize that the transition of presidential leadership is an important time in an institution's history, and I am pleased that the (planning) committee has been able to utilize this event as a way of spotlighting Indiana State's many partnerships and our commitment to community engagement," she said. "Indiana State could not be the institution it is today without (its) massive collaborative efforts." In addition to the university itself contributing nearly $400 million to the economy, 85 percent of State graduates remain in Indiana to live, work and raise their families. "Indiana State University is the state of Indiana's university," she said. "While we have students from across the country and around the world, the vast majority of our students are from Indiana. Indiana State plays a significant role in the preparation of the state's workforce and helps drive the state's economy." Curtis is the first woman -- and second graduate, after third president William Wood Parsons -- to lead the university. Earning a Ph.D. in curriculum and instruction/secondary education from State in 1986 served as her professional launch pad. "My career has now spanned more than 30 years in higher education," she said. 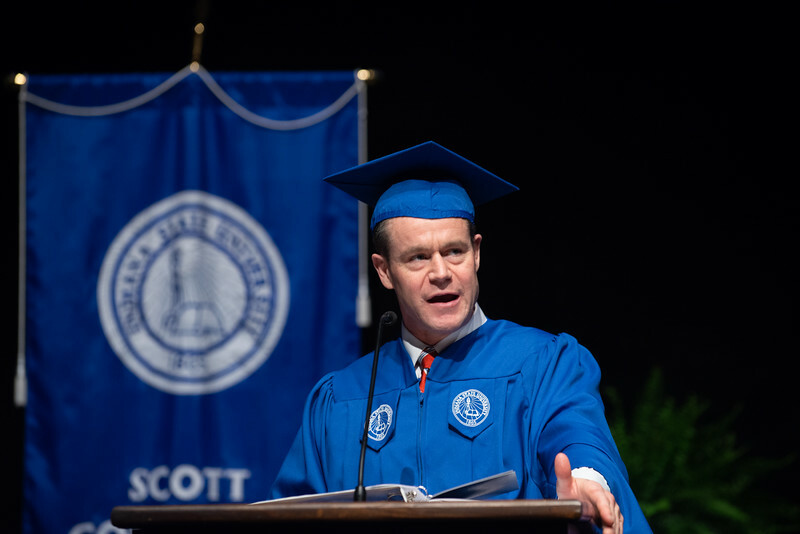 "All of that time has been spent at institutions that (like Indiana State) had their start as normal schools and who share a special and critical mission -- providing high-quality education at an affordable cost, often to students who may not otherwise have that opportunity." That mission resonates with Curtis. 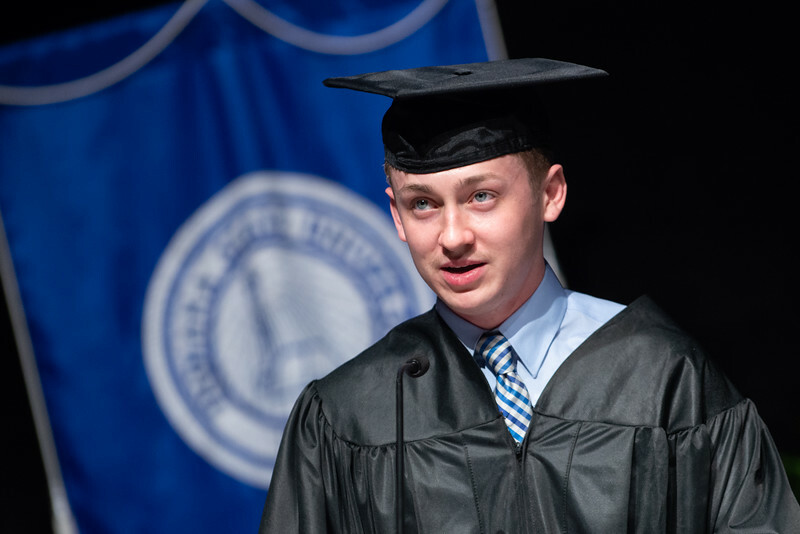 "I am proud to say I was a first-generation college graduate, and I personally and enthusiastically embrace the important mission that Indiana State serves. Earning that college degree transformed my life just as it does each day for our students and graduates," she said. Curtis reflected on the imagery associated with the university -- the stalwart Sycamore, selected by students in 1922. 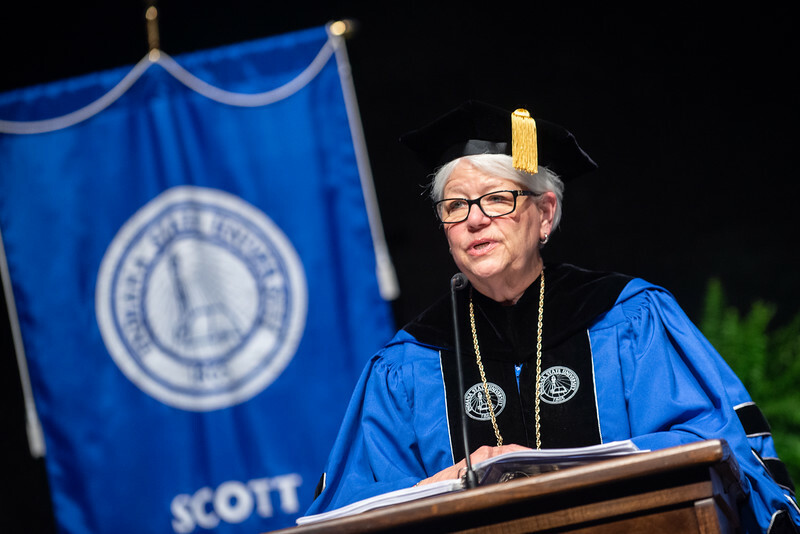 "The roots of the Sycamore tree represent the traits that have continuously fed our institution's success -- access, affordability, quality, diversity, experiential learning and community engagement," she said. "These values are at the core of all that we do and will continue to sustain our efforts." State's history of teaching and application of knowledge, creativity and service are the trunk of the university, as faculty are the heart of any institution of education. "Our academic offerings and our many partnerships are represented by the branches of our Sycamore tree," she said. "Some will grow swiftly with offshoots of their own. Others may take longer to flourish and often require cultivation along the way." And the many leaves are students, who similarly come in cycles, grow and change with the seasons. "The great thing about a university is that it is a living thing that continuously renews itself with the arrival of new students to be nourished as they absorb water and nutrients through the roots, trunk and branches. Just as these buds transform, so do our students as they absorb the knowledge and expertise of our faculty, engaging in experiences that transform them in and out of the classroom." More than 100 delegates represented the university's network of partners - sister institutions, nonprofit agencies, corporate entities and student organizations. "In planning today's ceremony, President Curtis requested that the inauguration activities focus on the university and its partnerships, rather than on her," said Trustee Ed Pease. "The transition team and the planning committee also wanted to ensure that the entire campus and the Terre Haute community were involved with the ceremony." Curtis highlighted the efforts of the Student Government Association, which led the charge with the American Democracy Project to once again have a voting center on campus, and Indiana State Dance Marathon that raised last weekend more than $200,000 to benefit children at Riley Hospital. The Charles E. Brown African American Cultural Center has for nearly 50 years worked to improve student success and provide educational programs on social and racial justice. Organizations such as Indiana Black Expo, the Incorporated Gathering, the Student African-American Sisterhood and Bless the Mic also celebrate diversity on campus and beyond, she said. "Our partnerships with the nonprofit community run wide and deep," she said. "United Way of the Wabash Valley, as the coordinating arm for 26 local agencies, serves as the conduit for a lot of volunteer work our students, faculty and staff complete each year including our efforts with Catholic Charities, 14th and Chestnut Community Center, the Kid Kare Project and others." Curtis also recognized delegates from Special Olympics, which was founded at Indiana State in 1969 by two professors, CANDLES Holocaust Museum and Education Center, Vigo County History Center, Swope, Arts Illiana, Art Spaces, the Terre Haute Symphony, the Veterans Memorial Museum, the Children's Museum and others. Athletic partnerships, especially those with sister schools in the Missouri Valley Conference, contribute to the college experience, she said. "In the same way that we strive for excellence in every classroom at Indiana State, let's commit to an expectation of excellence on the court, on the field, on the course, in the pool, and anywhere our student athletes compete," Curtis said. Public/private partnerships have helped the community revitalize its downtown and riverfront, she said. Curtis noted delegates representing academic partners -- in Terre Haute, Indiana and around the world -- who were present. "Let me conclude the partnership highlights by bringing attention to the very building we are currently occupying -- the Hulman Center has served this community for nearly 45 years. Countless community events ... take place here each year. Through a tremendous partnership with the state of Indiana, the university will soon be overseeing a $50 million renovation of this community asset." Curtis pledged to lead efforts to fine-tune the university's strategic plan in the coming months. Of particular interest are enrollment management, student affairs, inclusive excellence and advancement. "We pledge that we will do all that we can to ... take our university to the next level," she said. Dave Malooley, associate professor in the electronics and computer engineering Technology, was grand marshal of the processional. The Rev. Sharon Samsell of United Campus Ministries provided the invocation. "The United Campus Ministries helps address a significant problem many of our students and those who attend our sister institutions in Terre Haute face -- food insecurity," said Malooley. "In 2014, United Campus Ministries decided to address this concern by opening a food pantry specifically for college students." Trustee Jeff Taylor led the search committee with assistance from experienced search consultant Ryan Crawford from the firm Storbeck Pimental. "We have been blessed with strong leaders throughout our institution's history. On this grand occasion, we are formally welcoming to this distinguished company a woman who will build upon the foundation they have laid," Taylor said. "Dr. Deborah J. Curtis is a leader who possesses the traits we were looking for in our search process - boundless energy, tremendous dedication to students, visionary thinking and a sense of humor. We also found a woman of great intelligence, but with a humility that is rare among university leaders." As president of the Student Government Association, senior operations and supply chain management major Tanner Smith of Fishers, Ind., served on the search committee to hire Curtis. "Coming in as a 21-year-old young adult with little-to-no actual work experience, I fully expected to take a back seat in the process. What I found when I served on this committee ... is that when the people at Indiana State University say they care about student's voices and viewpoints, they really mean it." On a lighter note, Curtis wasn't about to entertain superstitions related to the date of her inauguration. "The (planning) committee asked if I had any concern about it taking place on Friday the 13th. My first reaction was, ‘Bring it on,'" she said. "Later, I was looking at the calendar and ... realized that today is actually my 100th day as president of Indiana State. I am sure that the committee had that in mind all along. So now it's time to look forward." A reception on the upper concourse of Hulman Center followed the ceremony. A presidential inauguration dinner was held Friday evening in the Sycamore Banquet Center. The net proceeds, estimated at more than $41,000, support the Michael L. Phillips Student Emergency Fund, which helps Indiana State students with unmet financial needs. Photos: https://photos.smugmug.com/Events/Events-by-Year/2018/Deborah-Curtis-Inauguration-2018/n-288cqk/i-Wb2nB9d/0/763775a7/X3/i-Wb2nB9d-X3.jpg -- Deborah J. Curtis is presented with the presidential medallion Friday, officially signifying her installation as the 12th president of Indiana State University. https://photos.smugmug.com/Events/Events-by-Year/2018/Deborah-Curtis-Inauguration-2018/n-288cqk/i-8wC4vqJ/0/76abf11c/L/i-8wC4vqJ-L.jpg -- U.S. Senator Todd Young (R-Indiana) congratulated Curtis on her inauguration. https://photos.smugmug.com/Events/Events-by-Year/2018/Deborah-Curtis-Inauguration-2018/n-288cqk/i-JfgxnBh/0/7e7aa95f/L/i-JfgxnBh-L.jpg -- President Curtis speaks to those in attendance. https://photos.smugmug.com/Events/Events-by-Year/2018/Deborah-Curtis-Inauguration-2018/n-288cqk/i-FqXv7Jt/0/dccdaa9d/L/i-FqXv7Jt-L.jpg -- As president of the Student Government Association, senior operations and supply chain management major Tanner Smith of Fishers, Ind., served on the search committee to hire Curtis. Even though she was undoubtedly the focus of the event, Curtis turned the attention away from her toward the university's impact -- and the partnerships that facilitate it.